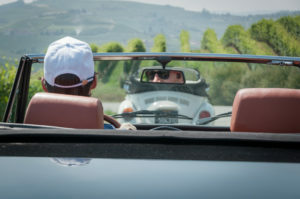 Discover the Langhe driving a vintage cabriolet. The emotion of a timeless trip through flavors and fragrances of unique territories. 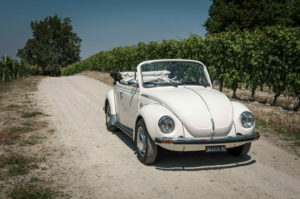 Driving Vintage, self-drive classic car rental. On the first day four stops will let you visit the magnificent Savoy Residences, recorded in the Unesco lists as “Residences of the Royal House of Savoy”: the Stupinigi Hunting Palace, the Royal Castle of Racconigi, the Agenzia di Pollenzo and last stop is in Alba, the most considerable town of the Langhe, well known for its world famous exhibitions. 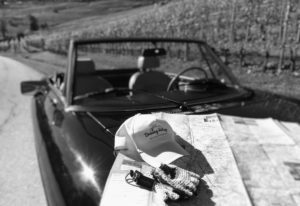 On the second day you will drive through La Morra, Barolo, Monforte d’Alba and Grinzane Cavour (Unesco World Heritage “Vineyard Landscape of Piedmont”).From Piazza Falletti in Barolo the view extends to the low Langa and the surrounding vineyards, which host the most prestigious Crù. Grinzane Cavour will impress you with its majestic castle. The third and final day will let you discover Diano D’Alba, Treiso and Neive, today considered one of the most beautiful towns in Italy. In this small hillside area grows the precious white truffle.The last stop before the return is the wonderful town of Barbaresco (Unesco World Heritage “Vineyard Landscape of Piedmont”), surrounded by vineyards planted with Nebbiolo grapes. Included kilometers 270 km (for the exceeding kilometers a fee of € 0,50 per km will have to be paid). Rental hours: check in (car withdrawal) from 08:30, check out (vehicle return) before 18:30. Technical data sheet for the use of the vehicle and its equipment. Car withdrawal and return in San Maurizio Canavese (Turin). Welcome customer at Sandro Pertini Airport (Caselle Torinese). Train stations: Caselle, Caselle Airport, San Maurizio Canavese. Possibility to park the client car in a private fenced area. Fuel consumption: the car will be delivered to the customer with a full tank of petrol; It will be customer care to restore the fuel level before returning the vehicle. Charges for tolls, parking and possible fines/sanctions. Delivery and collection on demand at a location identified by the customer.